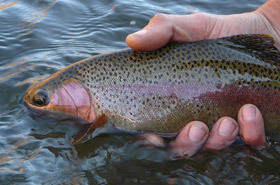 Wild rainbow trout flourish in all the rivers and streams we fish. Since no stocking of trout in moving water has been permitted in Montana for over 3 decades, all of these rainbow trout have been spawned wild. As a result, the quality of the fish is very high as they are produced in a natural environment. You will find a range of different opportunities to catch rainbow trout while fly fishing in our area rivers. Depending on the location you fish, you will have the opportunity to catch some very large rainbow trout. You can expect to catch wild Montana rainbow trout in the 12”-18” range on the Bitterroot River, Blackfoot River and lower Clark Fork and expect fish in the 10”-16” range on Rock Creek and the upper Clark Fork Rivers. Since the removal of the Milltown Dam, more rainbows and some larger rainbows are being seen on the upper Clark Fork. This section of the river could become a much more prolific rainbow trout fishery as this is a promising trend. When mayflies are hatching on slick runs and the rainbow trout are rising to them, matching the hatch is the name of the game. When the fish are rising to smaller flies that are more difficult to see, double dry fly rigs are the way to go and will catch those rising rainbow trout. Since nymphs and nymphing are always the most productive fly fishing technique for all trout including rainbows, dry/dropper combos are a great option to give you the best of both worlds. However, sometimes it is more dry fly prospecting with a nymph working deeper in the water column and sometimes it’s more nymphing with a dry fly as an indicator, it’s still the dry/dropper combination that is the go to rig for all our trout fishing. These rigs produce fish and a lot of our fish are these beautifully colored, acrobatic, wild rainbow trout.